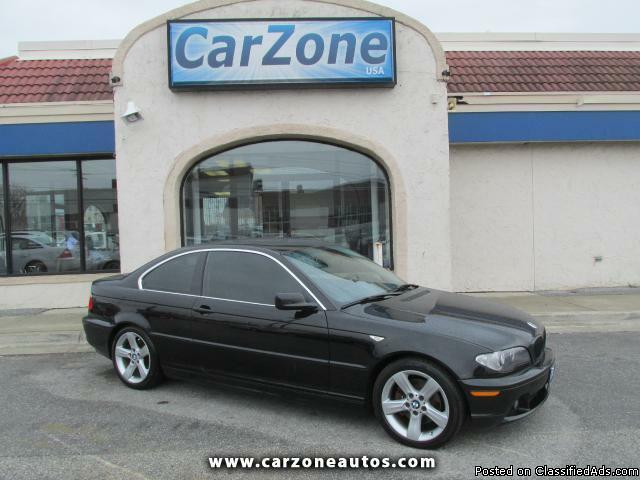 xxxx BMW 325Ci COUPE | Jet Black with Black Leather Interior | With 5-Star safety ratings from the NHTSA, the 04 BMW 325ci received 5 out of 5 power circle ratings in interior quality, mechanical quality, and performance! Equipped with leather heated seats, wood trim, a sunroof, and CD player, the 325ci coupe is sleek, attractive and well-built! Edmund's calls it ''luxurious and powerful, with exceptional road manners'' and ''the best car in the entry-luxury category.'' With 10 out of 10 consumer ratings from Kelly Blue Book, consumers praise its ''elegant, distinctive design'' and say its ''all about the driving dynamics.'' If you're looking for a fun to drive coupe, this is should definitely be on your test drive list!